Bring us your damaged vehicle or restoration project and you can count on your repairs being handled properly. We do all body work exclusively in-house so we can control the quality. From panel repair or replacement in our fabrication shop, through all stages of body preparation, to the application of final color and clear coats. 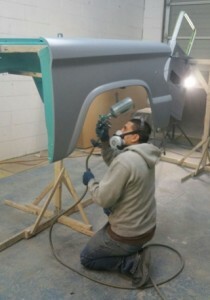 Every paint job begins with removal of ALL trim, chrome and glass, and removal of the trunk lid, hood, doors etc. Existing paint is removed to expose bare steel. Even the factory lead is removed and replaced with new lead. 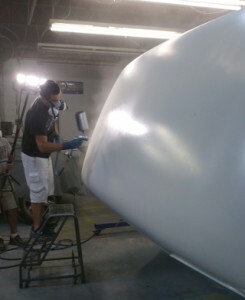 We go this distance to ensure the best quality paint job for your car. We are a registered New York State Automobile Repair shop. We will work with your insurance company to provide the best quality collision repairs.